Plant magical gardens and rebuild the five castles of Nevernear. "I absolutely loved both Jewel Match 2 and Jewel Match 3. The game levels are well constructed and challenging. I recommend the game and if you are going to buy it, buy the collection." Restore the land of Nevernear in this dazzling Match-3 adventure. Luna stops receiving letters from her family, only to discover that her kingdom is in ruins. Large crystals encase her family, and only by using magical gems can she free them. What Luna doesn't realize, however, is that her kingdom isn't the only one affected by this curse. 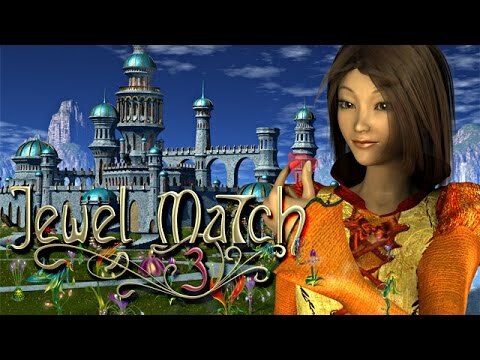 Plant magical gardens to ward off evil as you rebuild the five castles of Nevernear in Jewel Match 3. Downloaded perfectly. It's a fun, attractively designed Match 3 game that can be played untimed or in a more challenging timed mode. I love this game! It is as challenging as you want it to be. It is great for your mind, your coordination and imagination. I like challenges and this game keeps you thinking. Every map is a different challenge. Helps you to be creative and is tons of fun.